Institution owners, principals or lecturers can write to the digital platform to avail of the free service. BENGALURU: Erudex, a US-based EdTech company providing study solutions for the K-12 segment, has announced that its platform along with study material and tests are now free for all students across intermediate second year in the twin Telugu states. Parents can now place a request at their respective college to gain free access to the Erudex platform and study material, said Vijay Vallabhaneni, Co-founder & CEO of Erudex. 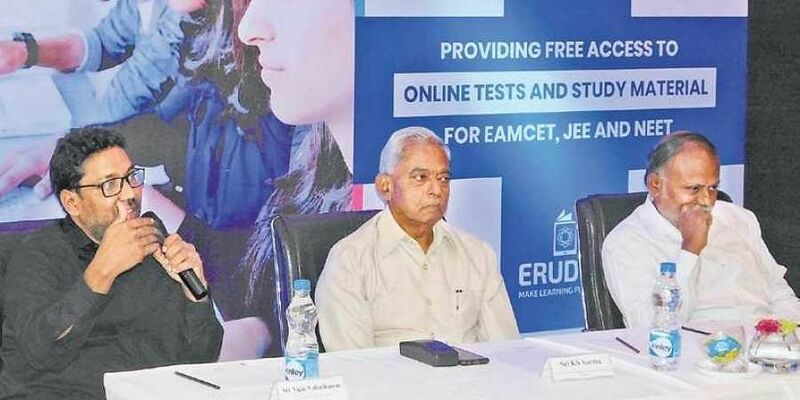 “With EAMCET joining JEE to conduct its exam online, students face a new set of challenges have taken over colleges and students since a majority have limited or no access to a computer-based learning environment. We are providing 5,000 digital classrooms in Telangana & Andhra Pradesh with over 2 lakh students benefitting from the content and practice material on the platform and over 950 classrooms in Mauritius are enabled with the tablet-based solutions. We provide a hands-on experience of an actual entrance exam through which teachers can conduct mock and practice tests for students. The platform also has exclusive JEE, EAMCET and NEET concept resources and other study material along with access to performance and usage reports of individual students. The platform also includes SCERT and NCERT boards certified K-12 content and study material that is mapped to CBSE, TSSB and APSB curriculums, 800+ hours of topic-level video content, 2 lakh questions and solutions, Board and Entrance-exam materials for MPC and BiPC groups, and JEE, EAMCET and NEET, access to computer-based testing for students to practice from the college campus or from their homes and individual online accounts to all teachers to conduct practice, mock and grand tests. Institution owners, principals or lecturers can write to the digital platform to avail of the free service.